The Golden State Warriors look to take a commanding lead in their first-round 2019 NBA Playoffs series against the Los Angeles Clippers on Monday night. Game 2 tips off from Oracle Arena at 10:30 p.m. ET. The two-time defending NBA champions used a late first-half surge to break open Game 1 and pull away for a 121-104 victory. Steph Curry had 38 points as Golden State won its sixth consecutive postseason opener. With eight three-pointers, Curry passed Ray Allen for the most career postseason triples with 386. The Clippers drained 11 three-pointers of their own, but were unable to overcome a double-digit deficit in the second half. Golden State is a 13.5-point favorite and the over-under for total points scored is 231 in the latest Warriors vs. Clippers odds. Before you lock in your Warriors vs. Clippers picks, check out the NBA predictions from the SportsLine Projection Model. The model, which simulates every game 10,000 times, is crushing its NBA picks. It entered Week 26 of the 2018-19 NBA season with a sterling 292-234 record on all top-rated plays, returning more than $4,000 in profit to anybody following them. And it has been particularly red-hot on its A-rated NBA picks against the spread, entering the Week 26 on a strong 76-59 run. Anybody who has followed it is way up. Now, the model has locked in on Game 2 of Warriors vs. Clippers. We can tell you the model is leaning under, and it has also generated a very strong point-spread pick that hits over 60 percent of the time. That one is only available at SportsLine. The model knows top-seeded Golden State will be eager to build a 2-0 lead on its home court and squash the 8-seed Clippers’ hopes of pulling a monumental upset. Game 1 was competitive for most of the first half and tied 51-51 before the Warriors found a late spurt to take a 69-56 halftime lead. Draymond Green set the tone by hitting his first five shots. He finished with 17 points, seven rebounds and seven assists. Curry heated up with seven quick points during the decisive second-quarter run to give the Warriors breathing room. He also finished with a playoff career-high 15 rebounds. Kevin Durant had 23 points before being ejected late in the fourth quarter because of a spat with Clippers guard Patrick Beverly in which both received technical fouls. Durant also had three of Golden State’s 14 blocked shots. 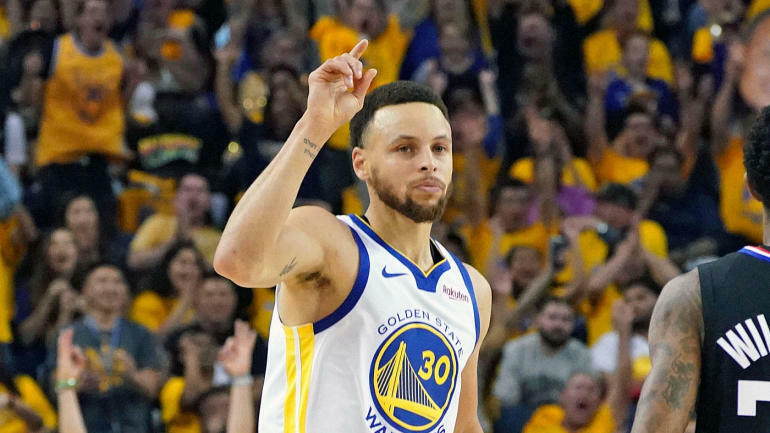 Still, Golden State is far from assured of covering the Warriors vs. Clippers spread on Monday against a Los Angeles club that has several positives to build on despite the Game 1 defeat in the NBA Playoffs 2019. Lou Williams had 25 points, nine assists and three rebounds. Montrezl Harrell finished with 26 points, five rebounds and two blocks. Rookie Shai Gilgeous-Alexander had a strong playoff debut with 18 points, five rebounds and three blocks. Danilo Gallinari added 15 points, eight rebounds and three steals. JaMychal Green added 10 points and six boards. The Clippers also forced 21 turnovers, managed 20 fast-break points and had 24 assists on their 38 field goals. Who wins Clippers vs. Warriors? And which side of the spread can you bank on in over 60 percent of simulations? Visit SportsLine now to find out which side of the Clippers vs. Warriors spread you should be all over Monday, all from the model that’s up more than $4,000 on top-rated NBA picks this season.